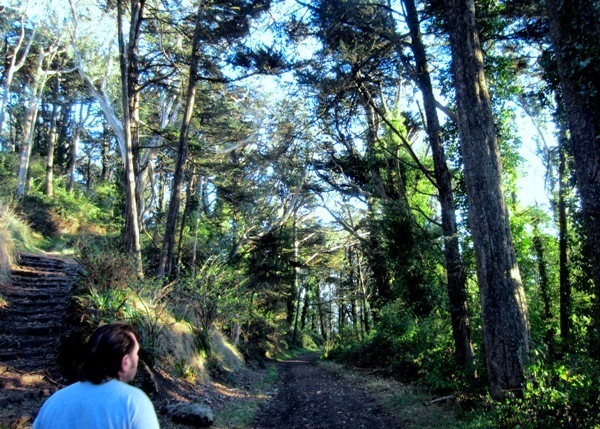 San Francisco Recreation and Parks Department’s Natural Areas Program (NAP) plans to remove 1/3 (10 acres) of the mature and healthy forest on Mount Davidson. We think the 30-acre forested area of the mountain should be removed from NAP’s control to prevent this destruction. 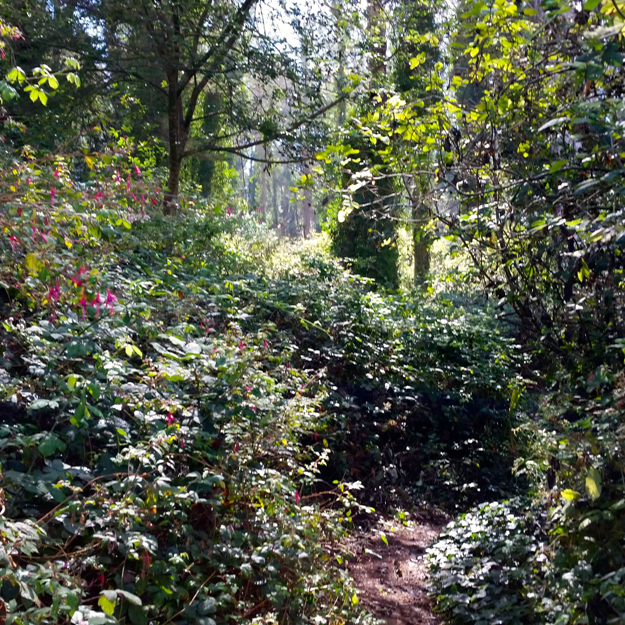 The forest should be managed by professional foresters, like those in the Presidio, not gardeners. In June, 3 years ago, U.C. Berkeley Forestry Management Professor Dr. Joe R. McBride (pdf link: MtDavidson_McBride_Ginsburg(06-29-13)) wrote about his inspection of the Mt Davidson forest, concluding that the Natural Areas Program’s Significant Natural Resource Areas Management Plan (SNRAMP) for the removal and thinning of different portions of the eucalyptus plantation on Mt. Davidson is NOT justified. He noted that the forest serves an important role in the history and visual characteristics of the city. Trees and the existing understory provide habitat for wildlife and wind protection for walkers. 1) Historic importance and Visual Value. The eucalyptus forest on Mount Davidson was planted under the direction of Adolph Sutro, philanthropist and former Mayor of San Francisco. The hilltops covered in eucalyptus trees and Monterey cypresses are a distinctive feature of San Francisco’s landscape. They’re been there for a hundred years and are an important historical heritage. 2) Eucalyptus is not invasive. 3) Eucalyptus groves are biodiverse. Eucalyptus groves are richer habitats for vertebrates than either redwood or Monterey cypress/pine forest; and are similar to dry chaparral and grasslands. Removing the number of trees shown in the Plan will expose the ground to more light than existing understory plants can tolerate. In the disturbed ground and increase light conditions, existing exotic species will proliferate and will have to be controlled by using even more pesticides. 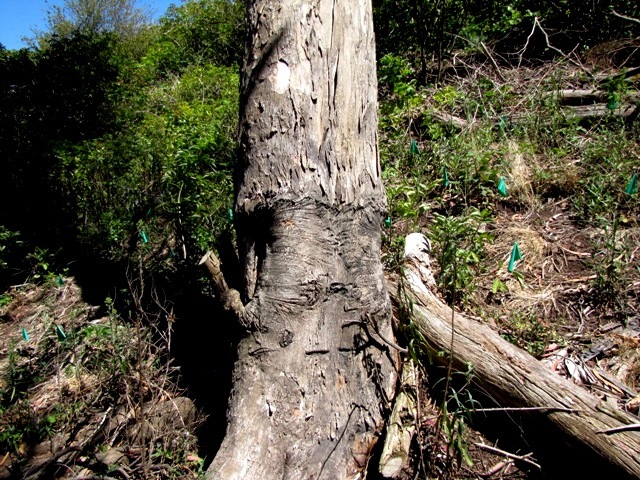 5) Increased wind-throw and breakage of remaining trees. Removing trees in this windy area will affect the trees that remain, which are not wind-hardened. More trees will go down. This is a very windy part of the city, with winds blowing in straight from the ocean. Walking recreationally on Mt Davidson will be a less pleasant experience. The Plan’s assumption that birds will quickly adjust to removal of 1600 trees is unfounded. Many birds return to the same nesting site each year. Cutting down large numbers of trees displaces these birds, and also causes a great deal of disturbance. Bird protection plans usually call for a 300-foot radius of protected area around a nest. 8) The forest is healthy. The dead trees in the forest have been girdled by someone/s with a vendetta against eucalyptus; few trees – if any – have died naturally. 9) Ivy is not a problem. English and Algerian ivy climbs up the trees, but cannot smother the trees by growing into the canopy. The only snags covered in ivy were those that had been girdled. 10) Regeneration is a 22nd Century issue. It’s been argued that the understory of ivy, Cape ivy, and Himalayan blackberry may restrict the establishment of eucalyptus seedlings. If so – and it’s possible – this is a problem for the next century. The forest, though 100 years old, is comparatively young. This could be revisited in another 100 years or so. Meanwhile, the understory provides an excellent food source and cover for wildlife. 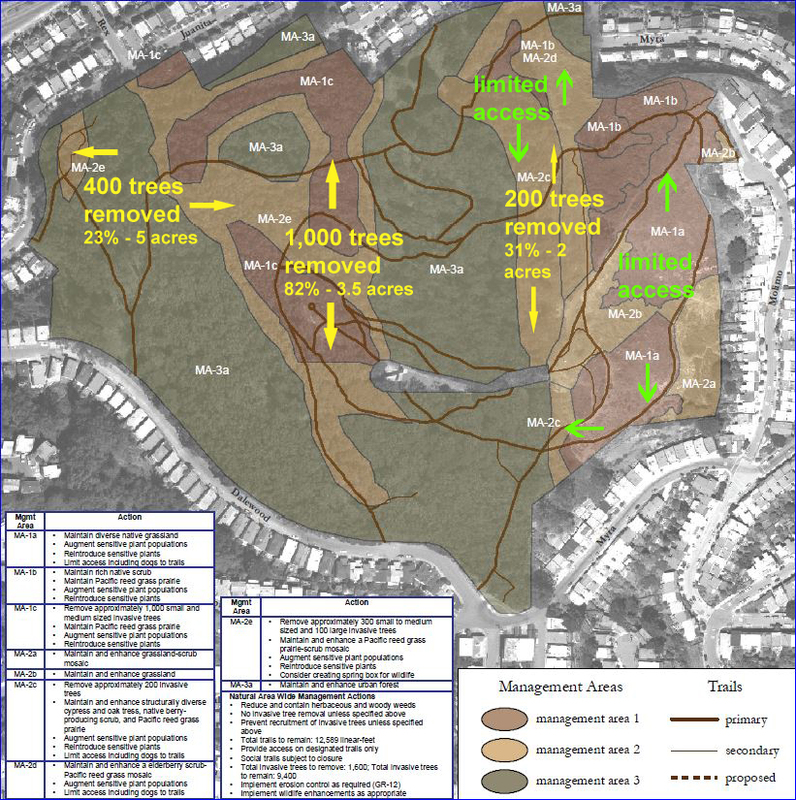 Below: Mt Davidson map shows where 10 acres of healthy, mature trees will be removed if the SNRAMP plans for maximum restoration are approved. The red, green and yellow notations highlight the information contained SNRAMP plans (as per notes on the lower, bottom left). What can we do abut this as citizens? I will be happy to flyer my neighborhood of the Haight if you provide me with flyers and talk with people on the street as well. I think if we reach out to their biggest donors we could have a chance at stopping this too. Their donors might not want their funds used in this way. Leave it allow and let nature take care of its own. Why would anyone want to destroy this area. 5o years ago it was a beautiful area and still is today. I have tried unsuccessfully to share this on Facebook so others can pass the word. Any ideas how? Hmm, wonder why it didn’t work. Then you can see our link to this article, and share it with your friends.